Support for deprecated protocols has been removed, simplifying the API. Since this all implies means a huge simplification of the API, updating should be a pleasant experience – but please let me know if you run into trouble. Let us write a fun example using the new API. I implemented a super simple browser console, running a shell on the server and communicating with the browser using WebSockets. Obviously this is quite insecure, so do not run this on your own server without adding proper authentication! As always, we start with a bunch of imports. We are using the snap backend here. I still need to write support for wai (or Warp), hopefully I can do that soon (or contact me if you would like to hack on this). Update: Ting-Yen Lai has been so kind to update the bindings for wai. You can now just use the wai-websockets package from Hackage! The main Snap application only supports four routes. The index page, two additional resources and our console handler, which we will look at in detail next. The browser will make a WebSockets connection to /console/:shell. The shell argument determines the command we will run. Obvious examples are /console/zsh, /console/bash, and /console/ghci. By using WS.runWebSocketsSnap, the HTTP connection is passed from Snap to the WebSockets library, which runs the consoleApp. Just shell <- Snap.getParam "shell"
Here, we have consoleApp, the actual WebSockets application. Note that WS.ServerApp is just a type synonym to WS.PendingConnection -> IO (). We start out by running the shell command, obtaining handles to the stdin, stdout and stderr streams. We also accept the pending connection regardless of what’s in there: proper authentication would not be a bad idea. We send every message coming from the browser to stdin. The copyHandleToConn and copyConnToHandle functions are defined later in this file. Now that our input/output is set up, we wait for the shell to finish. 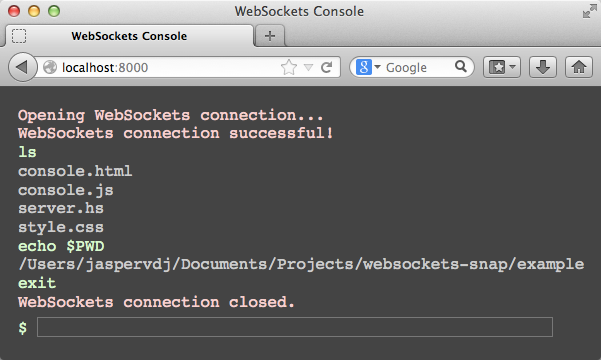 Once our WS.ServerApp completes, the WebSockets connection will be closed automatically. The first utility function is a loop reading from a plain IO.Handle, and using WS.sendTextData to send messages to the browser. The second utility function does the reverse. It uses WS.receiveData to wait for and receive messages from the browser. It writes these to the provided IO.Handle. We also watch for the WS.ConnectionClosed exception, so we can cleanly close the handle. Recently, the war on IO libraries started again. Since this blogpost is somewhat about a port between two IO libraries, some of you might think I have an enlightened opinion on this subject. I do not. I can see how pipes and conduit make creating and composing IO streams easier, but I do not have a clue about which one is easier to use, or more formally correct. pipes, conduit, enumerator: provide high-level easy-to-use combinators for doing IO. This is a great way to rapidly write great applications. System.IO, io-streams: provide lower-level access to IO resources. I think these are great to write libraries, since libraries built upon these IO libraries can be easily integrated into any application. I have had some trouble in the past integrating the enumerator-based WebSockets library with conduit-based Warp. I think it might also be tricky to use a pipes-based library in a conduit-based application, and vice versa. However, by building libraries on top of io-streams (or System.IO, but I think io-streams is more convenient), I get libraries that are easy to integrate almost everywhere.